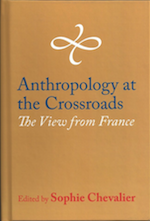 Institut interdisciplinaire d’anthropologie du contemporain - Anthropology at the Crossroads. The View from France. 2016. Anthropology at the Crossroads. The View from France, 2016. The influence of French intellectual thought on anthropology worldwide has been immense. This set of outstanding essays examines the influence of Lévi-Strauss, internal debates concerning anthropology’s place within French culture, the way that anthropologists in France approach the dilemmas of practising in a globalized world, and the shifting relationship between anthropology and museums. They also contain a highly stimulating discussion of how anthropology ‘at home’ has a particular trajectory in France. Together, they allow us to appreciate better why France has been such a stimulating laboratory for anthropological thought and why it is likely to remain so in the future. Indeed, leading figures have emerged there not only because of the brilliance of French academic culture, but also because of a specific readiness to combine an interest in public life and philosophy with anthropology.